10 Heart Necklaces Under $5! You are here: Home / Great Deals / Amazon Deals / 10 Heart Necklaces Under $5! 10 Heart Necklaces Under $5! Looking for a new necklace to wear for Valentine’s Day or a fabulous and frugal gift for your sweetheart? 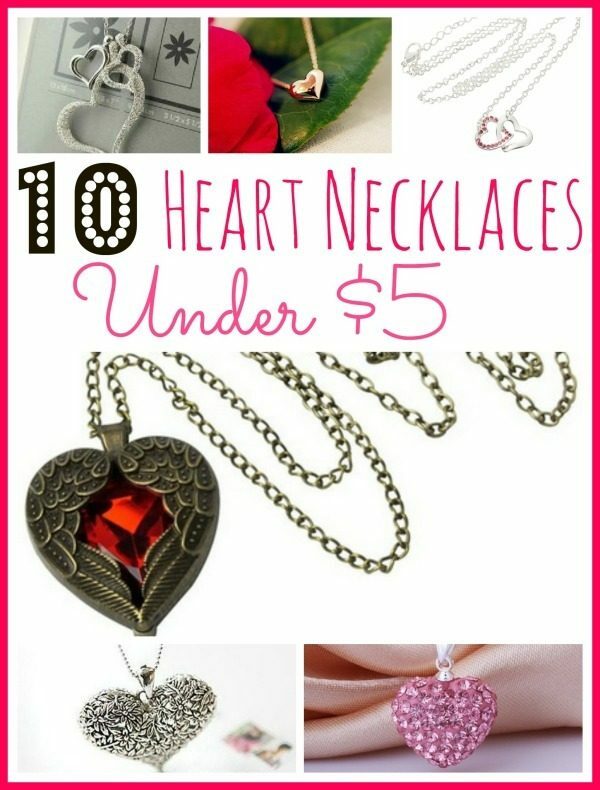 We have you covered with our list of 10 Heart Necklaces Under $5 shipped! These are so cute and range from hollow necklaces to crystal, from rhinestone to flower filled necklaces. I love these inexpensive cute necklaces for gifts or for myself! Make sure you take a look at these – they are so inexpensive you can even buy a few for your gift closet, too! Flowers and candy are nice – but, of course, they don’t last and you can wear a heart necklace anytime! Valentine’s Jewelry Deals: 10 Heart Necklaces Under $5! Bronze and Red Heart Necklace , $3.99 + FREE shipping! Open Heart Necklace , $4.50 shipped! Gold Small Heart Necklace , $1.99 + FREE shipping! Crystal Heart Necklace , $3.68 shipped! Hollow Heart Necklace , $3.95 shipped! Flower Heart Necklace , $3.50 shipped! Rhinestone Hollow Heart Necklace , $3.00 shipped! Diamond Explosion Hollow Heart Necklace , $5.50 shipped! Crystal Heart Necklace , $3.76 + FREE shipping! Silver Heart Necklace and Earring Set , $3.54 + FREE shipping!